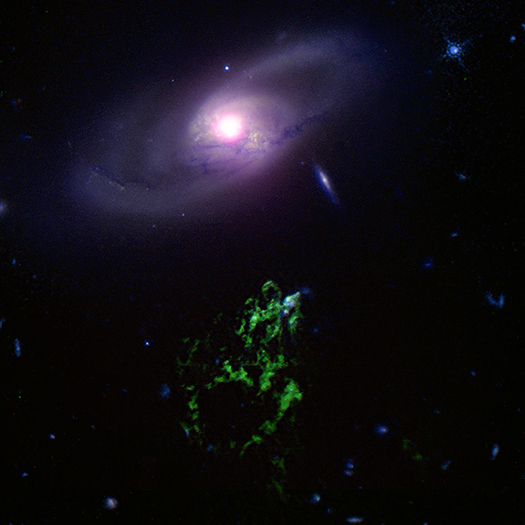 Hanny’s Voorwerp- Dutch for “Hanny’s Object” and more casually known as the “Green Blob”- is an intergalactic gas cloud located approximately 680 million light-years from Earth. Adjacent to Hanny’s Voorwerp is IC 2497, a galaxy approximately 200,000 light-years from Earth and similar in size to our own galaxy, the Milky Way. It appears very faint due to the galaxy’s immense distance. Most amateur telescopes cannot detect IC 2497, remaining unremarkable and lost among the the sea of galaxies within the known universe. That is, until 2007, when Dutch schoolteacher Hanny van Arkel noticed a mysterious green object near its outskirts. While participation in the Galaxy Zoo project- an online system which enlists citizen aid to classify galaxies found by the Sloan Digital Sky Survey and deep Hubble imagery- Hanny van Arkel discovered the intergalactic gas cloud now named in her honor, Hanny’s Voorwerp. Like most discoveries in astronomy, it left astronomers swimming in a stream of questions. Why does it glow green? Do others like it exist? How did this object form? Let us address the first two questions. The scattered greenish appearance is caused by the ionization of oxygen atoms. When ionized, oxygen characteristically emits green light. On Earth, when the solar wind ionizes the oxygen atoms in our atmosphere, the auroras form. But what ionized the same atoms in Hanny’s Voorwerp? And so the mystery begins. The most popular theory amongst astronomers follows that the supermassive black hole at the center of nearby galaxy IC 2497 was originally a highly active quasar some 100,000 years ago. Quasars are some of the most destructive forces in nature. They can emit streams of energy powerful enough to destroy the formation of a galaxy, and it is believed this was the fate of a small galaxy we now see as Hanny’s Voorwerp. But there is one tiny problem. There is no visual evidence of a quasar in this region, and the black hole exhibits little activity. Bear with me while I explain astronomers’ theory for their theory. Recall that Hanny’s Voorwerp measures significantly further from Earth than IC 2497, 680 million light-years compared to 200,000. It is possible that between the time it takes the light from the voorwerp to reach Earth that the theoretical quasar has “turned off” or rather depleted its material energy source. Today, NASA’s Chandra X-ray Observatory released a new composite image of IC 2497 and Hanny’s Voorwerp which reveals an important clue to eventually solving this mystery of the Green Blob’s formation. Surrounding the outer edges of the black hole is a region of extremely hot gas, but the center of the black hole’s x-ray emission reveals much cooler gas. Astronomers like to refer to this cooler center region as a bubble surrounded by the outer hotter gas region. This supports the theory that a quasar originally existed at the center of the galaxy, and that a pair of jets from the now weaker black hole blew away the hot gas created by the quasar. Astronomical detective work at its finest. Astronomy, Chandra, discovery, galaxy, Hanny's Voorwerp, NASA, quasar, science. Bookmark.